Some delays are fun: Rick Dempsey sliding down the wet tarp at Memorial Stadium made rain delays exciting, and DJs who play with the five-second radio delay always makes me giggle. Add to that list Texas Rangers. Miramax delaying Texas Rangers is fun. Maybe even more blissful than The 13th Warrior (AKA Eaters of the Dead) being pushed back for two years. Texas Rangers was originally slated for April 2000, which was then delayed to a firm date of August 25th. It was promptly moved up to August 11th a couple weeks later. Then in June of 2000, Texas Rangers was pushed back to spring of 2001. Woo-hoo! Then the real fun began. American Outlaws (another teen-oriented Western) was set to open May 18th. So, Miramax said Texas Rangers will now hit theatres May 4th. Outlaws then went to April 11th, which made Rangers go to April 6th. Finally, Warner Bros had enough, and moved Outlaws all the way back to August. 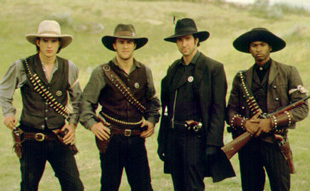 Miramax saw the Warner Bros move and pushed back Texas Rangers a full year to spring 2002. All good things must come to an end, and my enjoyment probably will stop when Miramax mercifully opens Texas Rangers in spring 2002. Perhaps an Imposter/Texas Rangers double feature, Miramax?